(CNN) When the Saudi Arabian artist Abdulnasser Gharem arrived in Los Angeles earlier this year, he brought with him a group of young contemporaries from his home nation. Gharem was in California to promote his first ever solo US show at the Los Angeles County Museum of Art (LACMA), no mean feat for a self-taught individual born far away from the world’s cultural capitals. Yet he was keen to share his successes with the next generation of ambitious Saudi artists. A former lieutenant colonel in the Saudi Arabian army, Gharam has paved the way for artists in the desert kingdom over the past decade. 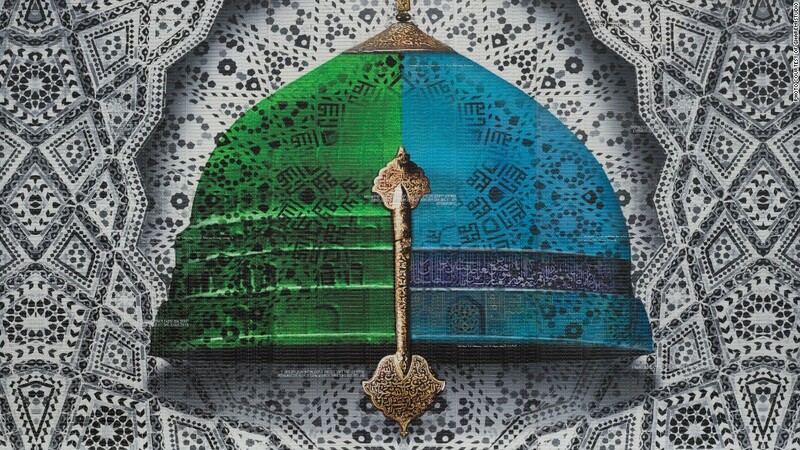 When his ornate dome-like installation, “Message/Messenger,” sold for $842,500 in 2011, it became the most expensive piece sold at auction by a living Arab artist. His experiences as a soldier and a creator, meanwhile, have underlined the complex, often provocative nature of his work. Yet pushing his creativity has not always been easy for Gharem or other Saudi artists. He describes his country’s capital, Riyadh, as one of the most conservative cities in the world. To counter this, Gharem founded his own studio which he hopes will foster young creative talent within the country. “In our country it’s very hard to say what you want but you can pass your idea through an artwork,” he later adds. 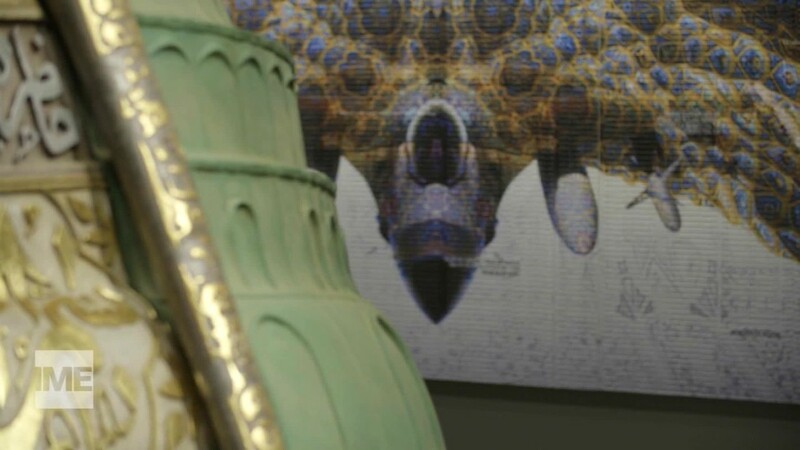 Gharem’s powerful back catalogue includes pieces like “Camouflage,” a stamp painting that depicts an army tank against the background of a mosque, and “The Capitol Dome,” an installation which appears to depict the U.S. Capitol building tilting on its side to reveal an interior decorated in Islamic style. His 2007 performance piece in the Saudi city of Abha, meanwhile saw Gharem wrap himself and a tree in a plastic sheet where he remained for six hours in order to highlight how imported trees were damaging indigenous Saudi ones. The tragic events of September 11, 2001, have also featured prominently in a number of Gharem’s works. Gharem was in the same class at school as two of the 9/11 hijackers — a revelation that made him question how individuals with a near identical upbringing to his own could be capable of such an atrocity. “We have the same knowledge, we have the same environment … you know, we are almost the same,” he explains. Gharem’s recent solo show at LACMA was called Pause, and brought together pieces influenced by his experiences in the aftermath of 9/11. Nearly 3,000 people were killed in the devastating terror attacks, the deadliest ever on US soil. Fifteen of the 19 hijackers who commandeered the planes that struck the World Trade Center in New York City and the Pentagon in Washington D.C. on 9/11 were from Saudi Arabia. The then head of al-Qaeda and orchestrator of the attack, Osama bin Laden, was also Saudi born despite being ensconced in the hinterlands of Afghanistan at the time. Yet Gharem is keen to show another side to his home nation and puncture oversimplified stereotypes about people from the Kingdom. “Those guys who did this 9/11, they are not representing us at all,” he says. “I think these kinds of pieces (referring to the artworks contained within his Pause exhibition) will let the people change their mind,” he adds. Read: Could biofuels for planes be grown in the desert? Gharem’s LACMA show ran from April until July. According to the museum’s curator of Islamic art, Linda Komaroff, Gharem’s work displays themes and techniques an American audience is likely unfamiliar with. She also posits that his LACMA exhibition offered an opportunity for people from the two nations to begin to understand each other. “This is very important at this particular moment in American history, and the world’s history,” Komaroff says. Gharem holds similar ambitions about his work breaking down cultural boundaries. But, naturally, he hopes the fact it has been exhibited in a solo show in America for the first time will act as a spur to other aspiring Saudi artists. “I hope what I’m doing is going to affect the society and going to inspire at least some young (people),” he says.